The managing directors of company Pieron, Sven Pieron and Christian Fehler, took a check about 4,500 EUR along when visiting the Youth Farm „Mit Dir“. Already for many years, this Bocholt company is supporting the Youth Farm, where the children and youths were allowed yesterday to look over the shoulder of Kai Koschowksi, the blacksmith of Bedburg Hau, while working. The donation comes from the social budget of the company, a fund supporting especially regional aid projects, said Sven Pieron. Also for years, the company spares the Christmas presents for its customers and spends the money to support social projects instead, added Fehler. The money is very welcome at the Youth Farm. 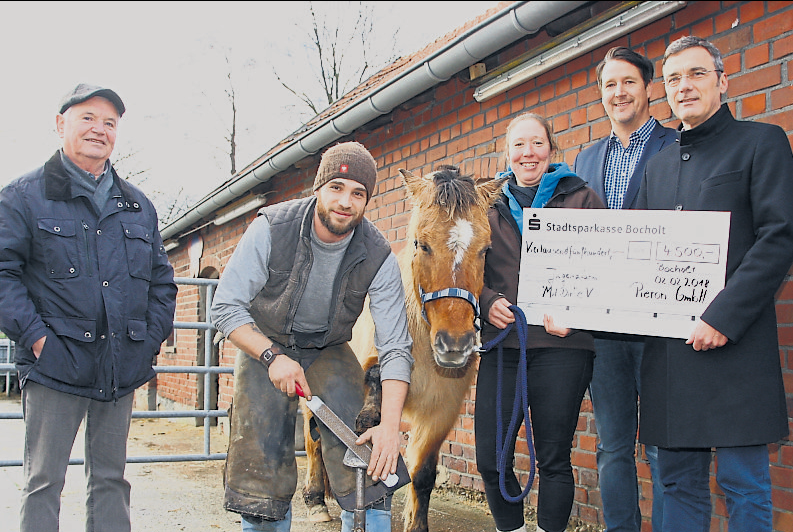 The donation will be used for especially hoof-protecting sand on the riding area of the Youth Farm, said Wilhelm Epping, board member of the association „Mit Dir“. Nadja Kaszubowski was also there. Since beginning of the year, she is the new head of the Youth Farm and takes care for the people and animals there.